A Viking feasting hall measuring about 47.5 metres in length has been identified near Vadstena in central Sweden. 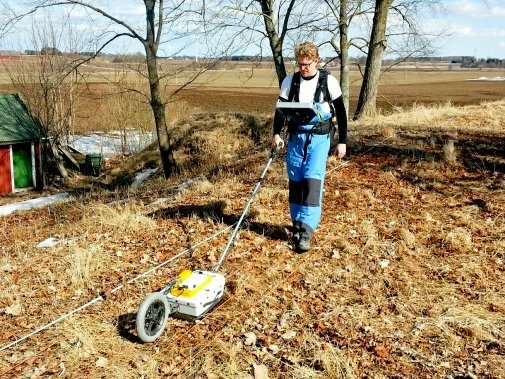 Archaeologists from Stockholm University and Umeå University used ground-penetrating radar, a non-invasive geophysical method, to locate and map the house foundation. The research, carried out by Martin Rundkvist and Andreas Viberg, can be found in the article, ‘Geophysical Investigations on the Viking Period Platform Mound at Aska in Hagebyhöga Parish, Sweden’, which was published today in the journal Archaeological Prospection. The building was about 14 metres wide and was equipped with double walls and four entrances. The measurements also indicate the presence of a large hearth with a diameter of ca. 2.5 metres. a residence of the Viking Period petty kings of Östergötland, a faction or dynasty about which coeval written sources are silent. Nor do they say anything specific about the archaeologically attested class of feasting halls on earthen platforms, although the Beowulf poet does describe King Hrodgar’s hall Heorot as a ‘high house’. The Viking Period of Sweden, unlike that of, for example, the Danelaw or Ireland, is just barely a proto-historical period. Östergötland is one of Sweden’s best-documented provinces in the written sources, and even here they do not permit narrative history before the thirteenth century. Only the archaeological record can help to understand earlier developments. Postulating a petty royal dynasty that held sway over Östergötland and kept a palatial residence at Aska as early as the ninth century is, from a source-critical point of view, quite a daring contribution to the debate over Viking Period politics. Indirectly, we are identifying the famous jewellery burial excavated near Aska hamlet as that of a queen who stood in personal contact with the Swedish royalty of Old Uppsala and their Danish counterparts at Lejre.